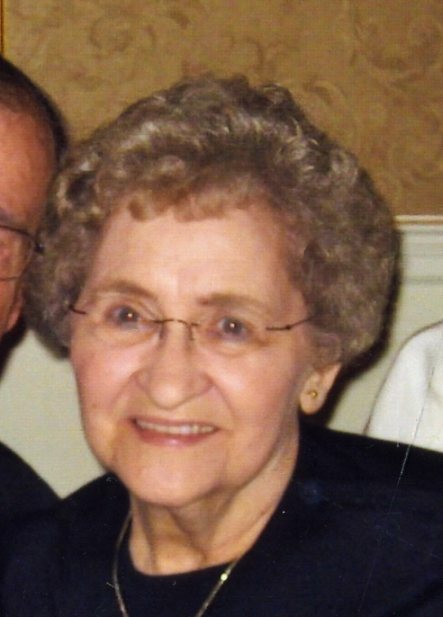 Agnes Sylvia (Uhric) Monti, 96, of Brackenridge passed away Tuesday, Jan. 29, 2019 at The Willows at Presbyterian SeniorCare, Oakmont. She was born Jan. 5, 1923 in Brackenridge, the daughter of Terezia (Krchnavy) and Joseph Uhric. She was preceded in death by her husband of 63 years, Aldo V. Monti. She was a 1940 graduate of Har-Brack High School, Natrona Heights. Agnes supported the “War Effort” by working at Allegheny Ludlum Steel Mill during World War II. She was a member of Our Lady of the Most Blessed Sacrament Roman Catholic Church for more than 65 years, where she was a member of the Ladies Guild. She enjoyed lunching with her sisters, where they often planned the yearly Uhric Family Reunion. She also enjoyed family Sunday dinner which she cooked after the 11 a.m. Mass . She was a famous for her spaghetti sauce and Italian salad. She enjoyed telling of her experiences at Frank Sinatra’s concert at the Stanley Theater, Pittsburgh, in 1942. She often wished that she would have become a teacher, something she practiced in life by teaching those around her. Whether it was passing along her spaghetti sauce recipe or teaching her grandsons the state capitals, Agnes didn’t need a classroom to educate. Anyone who came into contact with Agnes remembered her by her dry sense of humor. In addition to her husband and her parents, Agnes was preceded in death by her brothers John and Joseph Uhric, her sisters Mary Honzo Vavro, Christine Durci, Bernadette Rusnak, Julia Kracji, Helen Malinsky, Frances Magoc, and Irene Taliani. She is survived by her sister and next-door neighbor of more than 60 years Albina Rybicki. She is also survived by her son Richard (Eileen) Monti, daughters,Maribeth Monti (Arthur Garden), and Lori (Michael) Boylan, and her grandsons Richard Aldo Monti and Michael Monti Boylan. Friends will be received on Thursday from 4-8 PM in the Cicholski-Zidek Funeral Home, Inc., 1522 Carlisle St., Natrona Heights 724-224-8688, where a blessing service will be held on Friday at 10:30 AM. Mass of Christian Burial will follow at 11 AM in Most Blessed Sacrament Church with her pastor the Rev. John B. Lendvai as celebrant. Entombment will be in Mt. Airy Cemetery, Natrona Heights. To send an online condolence please visit www.cicholski-zidekfh.com. In lieu of flowers. contributions in memory of Agnes may be made the Willows at Presbyterian Senior Care, 1215 Hulton Road, Oakmont, Pa. 15139. A funeral vigil service will be held in the funeral home on Thursday at 3:45 pm.